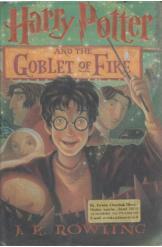 Harry Potter and the Goblet of Fire Book 4 by JK Rowling, American Edition, 734 pages. This book is the 4th in the Harry Potter series. Harry wants to be a regular 14 year old, go to the International Quidditch Cup, however, he is an uncommon wizard.